TOAST (Toolbox for Applied Seismic Tomography) makes methods of full-waveform inversion of elastic waves available for the practitioner. The inversion of complete seismograms is an utmost ambitious and powerful technology. One of its strengths is the enormously increased imaging-resolution since it is able to resolve structures smaller than the seismic wave length. Further it is sensitive to material properties like density and dissipation which are hardly accessible through conventional techniques. Within the TOAST project algorithms available in academia were collected, improved, and prepared for application to field recordings. Different inversion strategies were implemented (global search, conjugate gradient, waveform sensitivity kernels) and computer programs for imaging the subsurface in 1D, 2D, and 3D were developed. The underlying algorithms for the correct numerical simulation of physical wave propagation have thoroughly been tested for artefacts. In parallel these techniques were tested in application to waveform data. They proved their potential in application to synthetic data, shallow-seismic surface waves from field recordings, and microseismic and ultrasonic data from material testing. 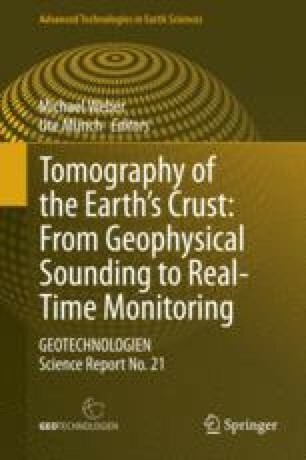 This provided valuable insight to the demands on seismic observation equipment (repeatability, waveform reproduction, survey layout) and inversion strategies (initial models, regularization, alternative misfit definitions, etc.). The developed software programs, results of benchmark tests, and field-cases are published online by the OpenTOAST.de initiative. The project TOAST was funded by the German Federal Ministry of Education and Research (BMBF) within the R&D programme GEOTECHNOLOGIEN (Grant: 03G0752A-F).